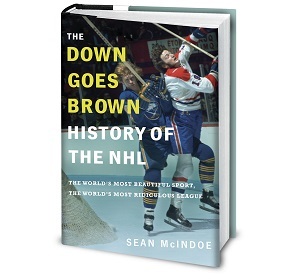 Down Goes Brown: 50 years without a Cup: Are the Leafs really the NHL's most miserable team? 50 years without a Cup: Are the Leafs really the NHL's most miserable team? Today is an important anniversary for Toronto Maple Leafs fans. You’ll notice I didn’t say “happy anniversary,” since this isn’t exactly a day that Leafs fans will want to celebrate. Oh, it marks the anniversary of a happy moment in franchise history; it was 50 years ago tonight that George Armstrong’s iconic empty-net goal sealed a 3–1 win over the Canadiens, securing the franchise’s 13th Stanley Cup. The not-so-happy part is what’s happened in the 50 years since. Or, more accurately, what hasn’t happened. A full five decades later, the Maple Leafs are still stuck on 13 Cups, as the team’s championship drought has officially reached the half-century mark. We’ve known this milestone was coming for a while now; it’s been clear for just about the entire salary-cap era that the Maple Leafs weren’t going to win a Cup any time soon. But there’s hope in Toronto these days, as the best collection of young talent the team has had in a generation seems to be on its way towards contending again, maybe as early as the next year or two. For the first time in ages, there’s some genuine optimism that the drought could end someday soon. Still... 50 years. Man, that's a long time. I wasn't alive back then. You probably weren't either. We knew this day was coming, but it still feels like a big number. From Harold Ballard to Kerry Fraser to JFJ to 4–1, it's been a rough stretch for long-suffering Leafs fans. But all that said, have the Maple Leafs really been the NHL's most miserable team over the last half-century? After all, it's not like they're the only team that hasn't won a Cup since 1967. That list is actually a reasonably long one, meaning even if we rule out one-off teams like the Rangers and Flames, we're still left with a dozen Cup-less candidates. So today, as we celebrate Toronto's dubious anniversary, let's compare them to the other teams that haven't won a championship since 1967, and try to figure out how they stack up against the Maple Leafs track record of misery. The history: Of all the teams who haven’t won a Cup in the post-1967 era, the Blues join the Leafs as the only one that actually existed back in 1967. And only barely; they took the ice for the first time as an expansion team that fall. That's led to an ongoing argument over whether the Blues and Leafs are tied for the NHL's longest Cup drought or whether the Leafs technically own the claim outright, which has to be just about the saddest sports debate there can be. Closest call: The Blues went to the Stanley Cup Final in each of their first three seasons, which sounds impressive until you remember that the NHL stuck all its terrible expansion teams in the same division, guaranteeing one of them a spot in the final. The Blues were the best of the worst all three years, but got swept each time and haven't been back since. They might be even worse than the Leafs at: Drafting. Like Toronto, the Blues have been better lately (the Vladimir Tarasenko pick was genius). But this is still the team that took Erik Johnson over Jonathan Toews in 2006, which not only set them back but also helped a division rival build a dynasty. And as bad as the Leafs have been, at least they never no-showed a draft entirely. But at least: From 1980 through 2004, the Blues made the playoffs in 25 straight seasons. These days, the Leafs are hoping to just get there in back-to-back years. Are they worse? : This one is closer than you think, especially since the Blues' three trips to the final don't really count. But their general consistency and lack of truly rock-bottom moments leaves them a notch behind Toronto on the misery scale. The history: While they give the Leafs a decent head start by not existing until 1974, the Capitals gain that ground back quickly by immediately posting the worst season in modern NHL history. The 1974–75 Caps team managed just 21 points, and the team didn't make the playoffs until 1983. And then things got bad. Closest call: The Caps at least made it to the 1998 Cup final, although they didn't win any games once they were there. Low point: At the rate things are going, check back in a few days. They might be even worse than the Leafs at: Protecting series leads. The Capitals have a stunning history of repeatedly blowing two-game leads in the playoffs; it's kind of their thing. Granted, it's not like Leaf fans can get all high and mighty about protecting playoff leads, but the Caps have dedicated decades to their craft. But at least: The Capitals have won three Presidents' Trophies in the last eight years; the Maple Leafs have only topped 100 points once in their history. Are they worse? : This one may be too close to call. The Caps have had lower lows, both in the regular season and playoffs. But they've also had higher highs, including that one trip to the final. Let's see just how heart-breakingly this season ends before we make any final decisions.